St Stephen’s Society exists to preach the gospel, reach the poor and see people set free through faith in Jesus Christ. Our heart is to go to the ends of the earth to make disciples. Jackie Pullinger came from England to Hong Kong over 50 years ago. 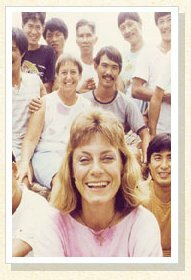 She started sharing the love of Jesus Christ with gangsters and the poor in the Kowloon Walled City. She began to see them set free from drug addiction and start new lives. Today, many of the people who met Jesus and came off drugs in Hong Kong have gone to other countries in Asia to share what Jesus has done. We are still dealing with all kinds of addictions. We have several homes where those with such problems can come, meet Jesus, be set free and healed, and learn what it is to follow Him. Our heart is not that they stay and live with us, but that once they have tasted of His sweetness, they will go to the ends of the earth to share what they have tasted. So now, we have those who have gone out from here, live in the poorest countries of Asia and the Indian Subcontinent and share the Gospel with those who have not yet heard.